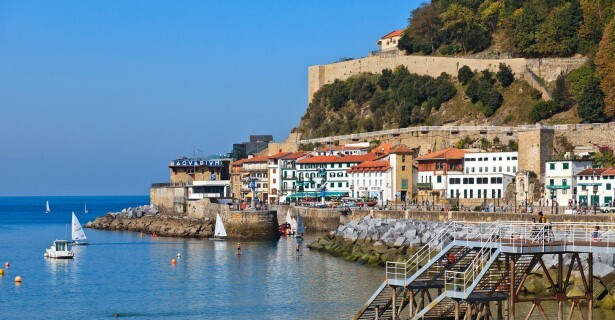 One of the more popular surf towns in Basque-speaking Spain with gorgeous in-city beaches sitting side by side major historical buildings and churches is San Sebastian. This coastal city, known as Donostia, sits right next to the Bay of Biscay and is the capital of Gipuzkoa, the province right at the Pyrénées-Atlantiques border with France. While San Sebastian’s attractions revolve around Playas de la Concha and de Gros, each with their own share of sultry beach goers and surfers, this svelte beach town also attracts travelers by San Sebastian motorhome rental, campervan hire or RV rentals in Spain for its proximity to a satellite of attractions within the Basque autonomous community and across the border into southwestern France. San Sebastian is an hour and a quarter away by RV rental from the Basque capital Bilbao, so you are never too far away from the Guggenheim Museum if you are hoping to be front and center of Cubist exhibitions. Then there’s the San Mames Football Stadium for the fan of the sport, and the atmospheric old quarter Casco Viejo for the history aficionado. A coastal itinerary will lead you past Bilbao to the port city of Santander, the historical capital of Cantabria. West of Santander, the local secret of a gem that is Asturias is four hours away by camper rental but a world apart from the industrial outer shell of Bilbao and the Belle Epoque elegance of Santander’s El Sardinero which survived the Great Fire of 1941. Asturias is where nature, gastronomy and culture all collide in a beautiful medley of Costa Verde, lakes, mountains, caves, archaeological and UNESCO World Heritages Sites. Pitch your motorhome rental or campervan hire in Santander where the scenery is most inspiring and help yourself to bean stew ‘fabada,’ cabrales cheese and apple cider. Galicia, the road at the end of El Camino de Santiago and the western tip of the Spanish Iberia, comes after it. An inland trip by San Sebastian motorhome rental will bring you to the region of Castile-León, of the historic union of the kingdoms of Castile and Leon fame. The medieval walls of Avila, Burgos Cathedral (burial place of national hero El Cid), and the interior of the Basilica of San Isidro (where the first parliament season was held in early 12th century) are worthy of more than a glance. If you would like to follow the concluding route of the French Way of St. James (El Camino de Santiago), the episcopal palace of Astorga is worth a day’s stop by campervan hire or RV rentals. Then it’s on to Ponferrada until you arrive at the Galician capital Santiago de Compostela whose cathedral hosts the remains of Christ’s disciple St. James.